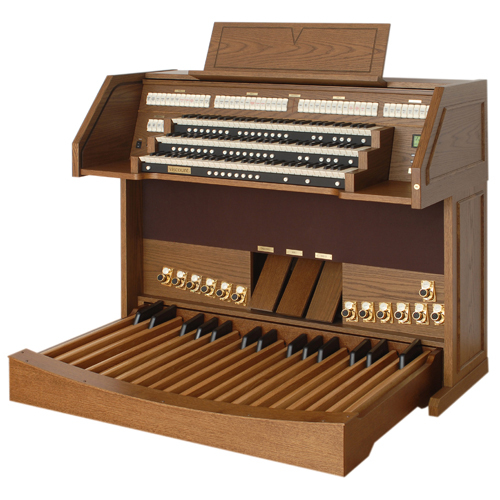 The Vivace 90 Deluxe is a beautifull organ. All details in the Vivace Organs reflect the highest standard of Italian craftsmanship. Thanks to the outstanding style flexibility, Vivace Organs can be played with up to 170 voices and all controls are easily accessible via the graphic display menus. Toe pistons are available for maximum flexibility. The cabinet is available in dark, medium or light oak real wood finishing, rolling cover and matching bench. The vivace 90 Deluxe is equipped with a 32 Notes pedalboard. Pedalboard 32 notes straight, str. conc., radiating conc.